This long-lost work contains eight marvelous effects for magicians everywhere. There are mental-flavored mysteries (including a dictionary test and a billet experiment), a vanishing flower from buttonhole effect, and several card tricks of the miracle class where the magic seems to happen almost entirely in the spectator's hands. 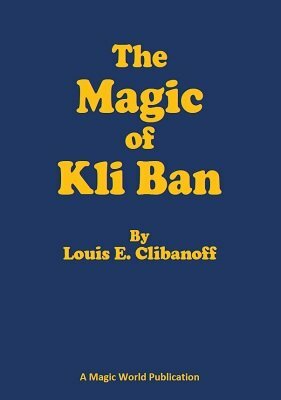 This is actually two manuscripts bound as one: Magical Odds and Ends and Kli Ban's Routine with a Borrowed Deck . The original work is "unobtanium," with copies so scarce as to be virtually nonexistent. We're happy to bring these effects back to a new generation of performers. Our favorites are the dictionary mental test and the three concluding effects, which occur as a single routine with a borrowed deck. Just the thing for when you're at a party or gathering and asked to "show us something." Typical of most Magic World publications, we've taken the liberty to include updates that offer alternative handlings and presentation tips that allow you to get the most for your performance magic dollar. 1st edition 1934, updated digital edition 2017, 32 pages.